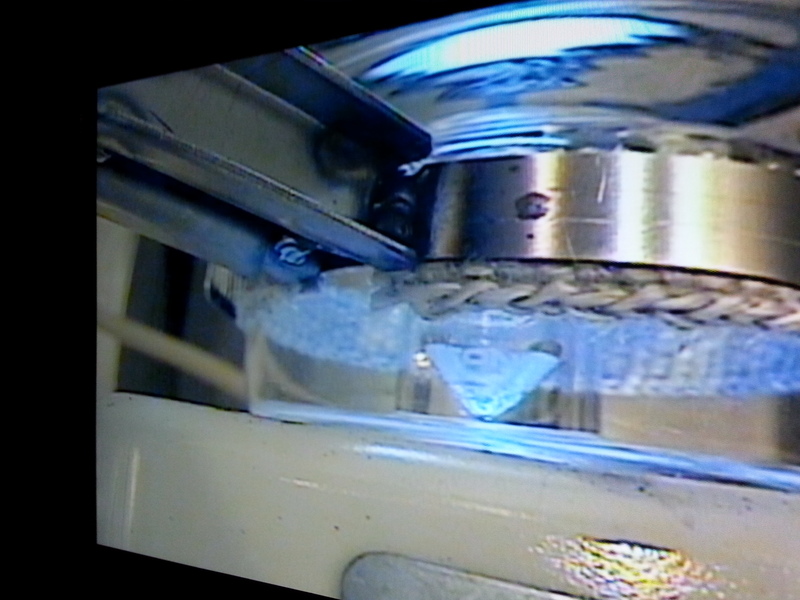 As part of the production process, an actinium-227 sample goes through a final step in the hot cell before being prepared for shipment. 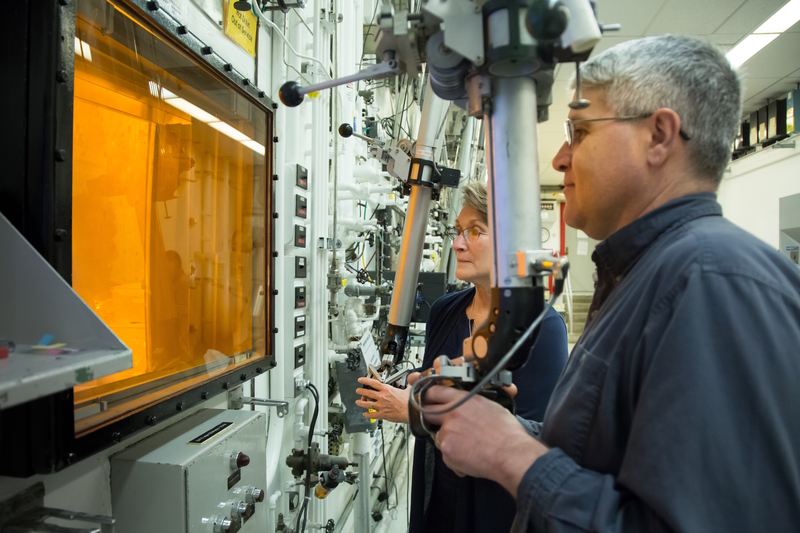 Radiochemical technicians David Denton and Karen Murphy use hot cell manipulators at Oak Ridge National Laboratory during the production of actinium-227. OAK RIDGE, Tenn., May 31, 2018—The Department of Energy’s Oak Ridge National Laboratory is now producing actinium-227 (Ac-227) to meet projected demand for a highly effective cancer drug through a 10-year contract between the U.S. DOE Isotope Program and Bayer. Xofigo (radium Ra-223 dichloride) is used to treat prostate cancer that no longer responds to hormonal or surgical treatment that lowers testosterone. Xofigo is for men whose prostate cancer has spread to the bone with symptoms but not to other parts of the body. Ra-223, the active ingredient in Xofigo, is currently derived from global supplies of existing Ac-227. After the U.S. Food and Drug Administration approved Xofigo in 2013, it was clear an alternative source of Ac-227 was needed. The drug is now approved in 52 countries worldwide. “As part of our longstanding commitment to improving the lives of those living with cancer, we are honored to be working with the Department of Energy and Oak Ridge National Laboratory’s radioisotope production experts and their unique facilities to ensure a sustainable supply of this important drug, Xofigo, into the foreseeable future,” said Carsten Brunn, president of Bayer Pharmaceuticals, Americas Region. With decades of experience in medical isotope research and production, ORNL was one of the few locations worldwide with the personnel and facilities necessary to develop and execute a new Ac-227 production method. Gillo also manages the DOE Isotope Program, which produces high priority isotopes in short supply for the nation. The program sponsored the Ac-227 production development effort and spearheaded negotiations with Bayer for sustained production. The new production process for Ac-227 begins with recovering radium-226 (Ra-226) from legacy medical devices secured by the DOE Isotope Program and diverted from a radioactive waste landfill. After recovery and extensive purification, the Ra-226 feedstock—which is fabricated into small targets—is then irradiated in the High Flux Isotope Reactor (HFIR), a DOE Office of Science User Facility at ORNL. Once irradiation is complete, technologists use specialized nuclear facilities to dissolve the highly radioactive targets and chemically separate and purify the Ac-227 created during irradiation. The Ac-227 is then packaged in a cask and shipped to Bayer in Norway. Bayer’s team periodically extracts the Ra-223 that grows into the ORNL-supplied Ac-227, via radioactive decay process, and ships it around the world for immediate use as a cancer therapy. ORNL’s team had two years to prepare facilities; undergo an extensive readiness review process; design, fabricate and install remotely operated equipment for the chemical separation and purification process; design targets for use in HFIR; develop the necessary processing chemistry; and demonstrate that the final product would meet Bayer’s specifications and regulatory standards. UT-Battelle manages ORNL for the Department of Energy’s Office of Science. The Office of Science is the single largest supporter of basic research in the physical sciences in the United States, and is working to address some of the most pressing challenges of our time. For more information, please visit https://science.energy.gov/.